This stunning raffle quilt, There’s No Place Like Home, 90″ x 90″, was hanging at the June meeting of Northwest Quilters in Portland when I lectured there. 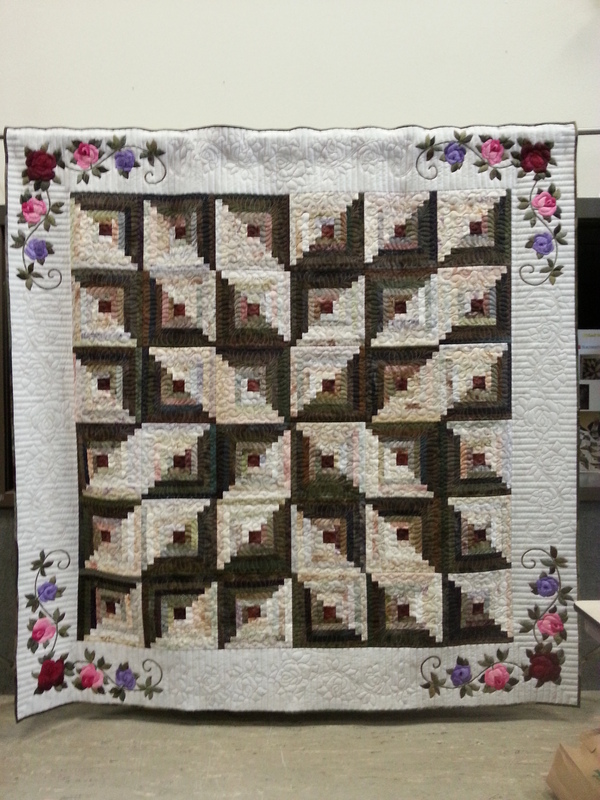 The Log Cabin is such a classic pattern and I love this star setting which is offset beautifully on the wide white border with floral applique. The Beautiful Cascading Roses applique pattern was designed by Joy Nichols. 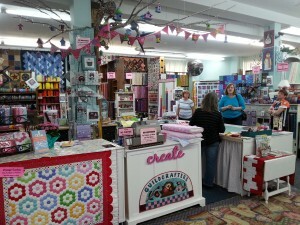 Joy, Nancy Tubbs, Gunnel Seitz and Trish Barrilleaux hand appliqued the roses. Long-arm quilter Debbie Scroggy of All Quilted did a spectacular job on the machine quilting. 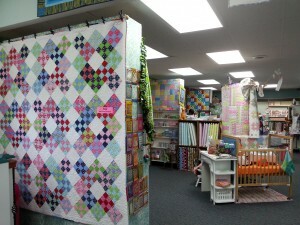 Several guild members pieced the blocks and helped with the completion of this gorgeous quilt. 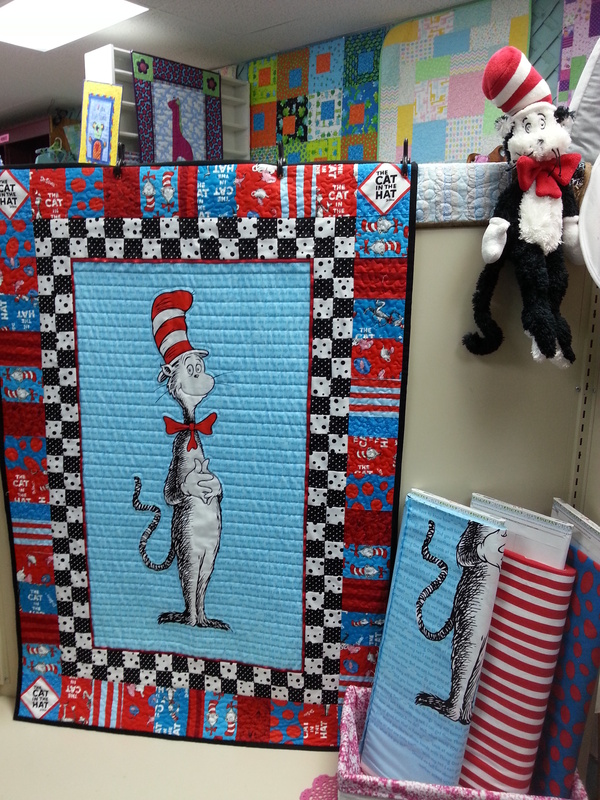 Raffle tickets may be purchased from Northwest Quilters members and at their 42nd Annual Quilt Show, May 6th and 7th, 2016 at the Portland Expo Center. 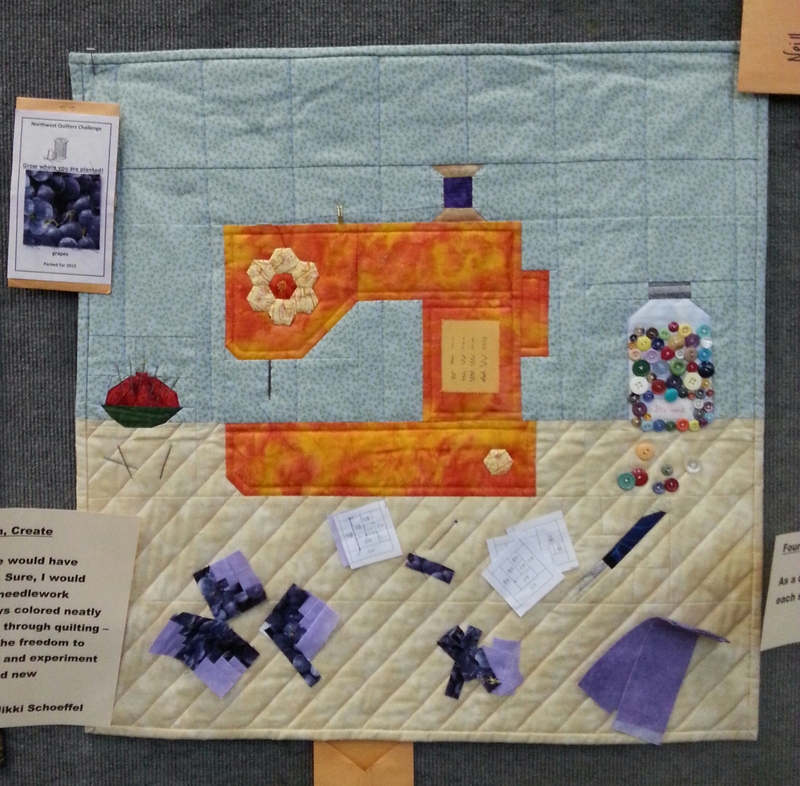 The drawing will be on Saturday 7th May at the end of the quilt show. 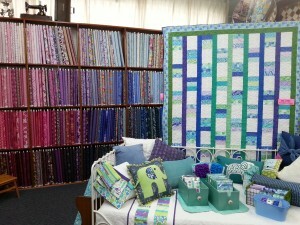 The proceeds go to cover room rental for community quilt project sew-ins and materials. 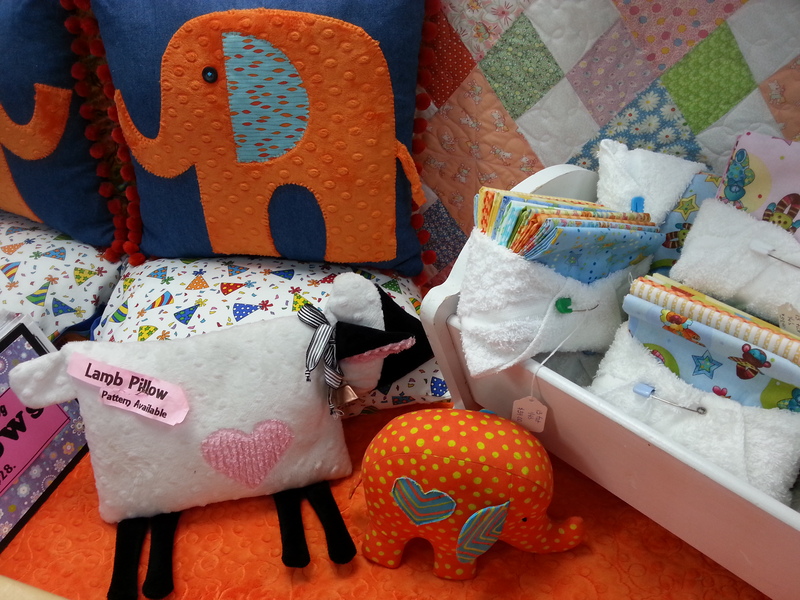 The quilts are donated to Habitat for Humanity, Quilts of Valor and Portland Firefighter’s Toy and Joy Program (dolls and teddy bears are wrapped in quilts). 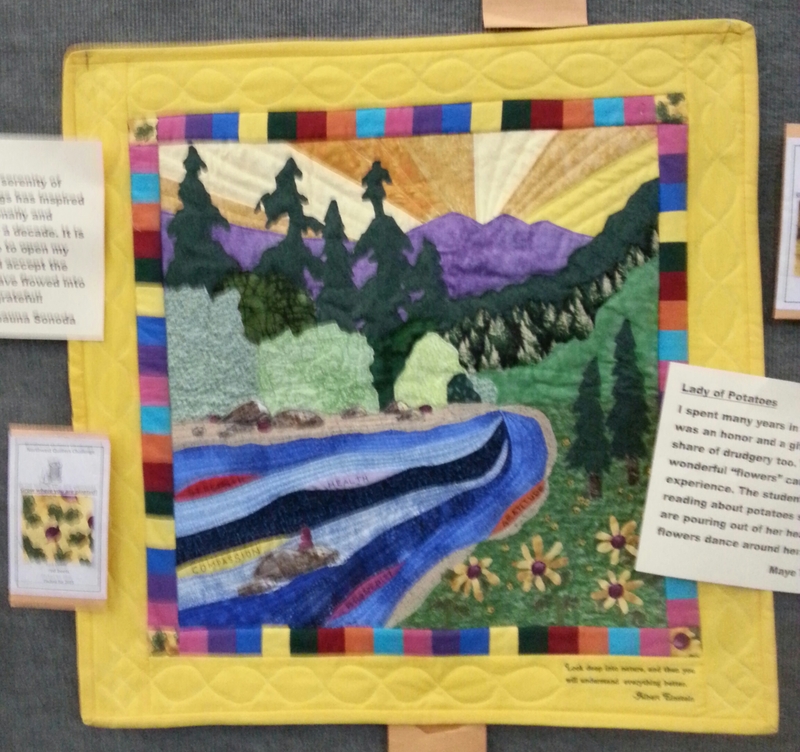 When I lectured at Northwest Quilters in Portland at their June meeting, there were at least 20 challenge quilts on display and members voted on their favorite. I encourage you to participate in challenges if you have the chance – it stretches your imagination and is a great opportunity for trying out techniques that you haven’t previously explored. The challenge topic provides the initial inspiration and is open for any kind of interpretation. For this challenge, each participant received a piece of fabric that had either fruits or vegetables on it. They had to use that fabric in at least five places in their quilt and the quilt had to be no larger than 24″ x 24″. Here are four examples. 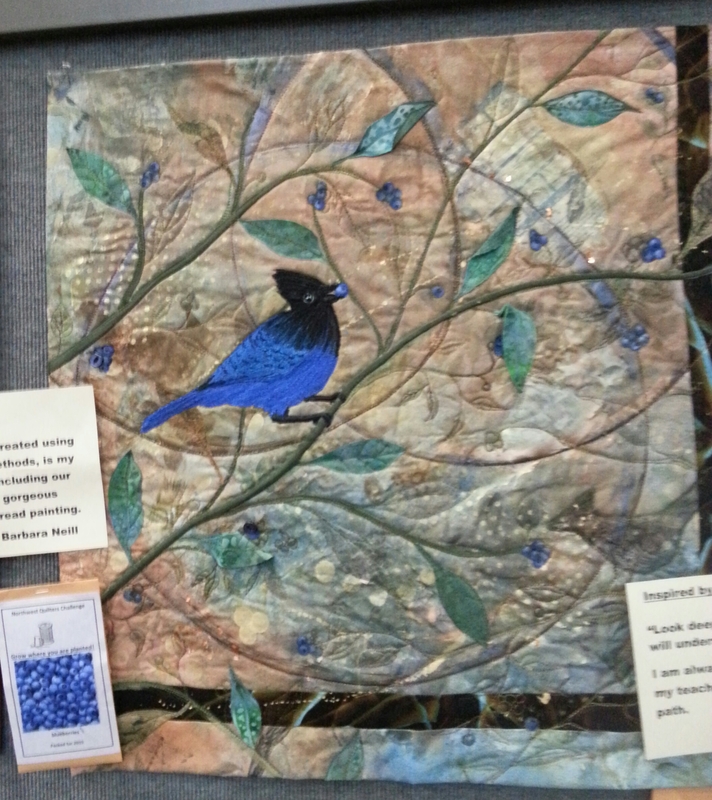 Shauna Sonoda made Nature is my Teacher (pictured on the left), this beautiful scene. She writes, “The beauty, color and serenity of Breitenbush Hot Springs has inspired me to grow both personally and professionally for over a decade. It is a place that taught me to open my heart and my mind and accept the many blessings that have flowed into my heart. I’m forever grateful!” Her fabric had beets on it. Denna Bandeen was inspired by trees swaying in the wind in December and made Dancing in the wind including the turnip fabric which she was given. Barbara Neill’s, A Stellar Harvest, was the winning quilt. 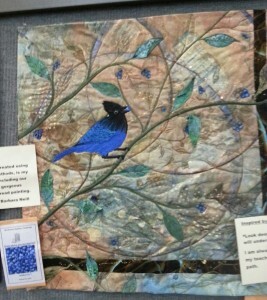 She used many surface design methods to create this very Northwestern scene with delicious blueberries (her fabric) and a gorgeous thread-painted Stellar Jay. 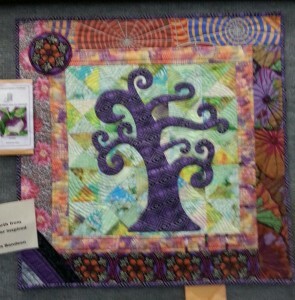 Design, Cut, Stitch, Create was made by Nikki Schoeffel who used her grape fabric in the Log Cabin blocks by the machine. Nikki writes, “Growing up, no one would have called me creative. 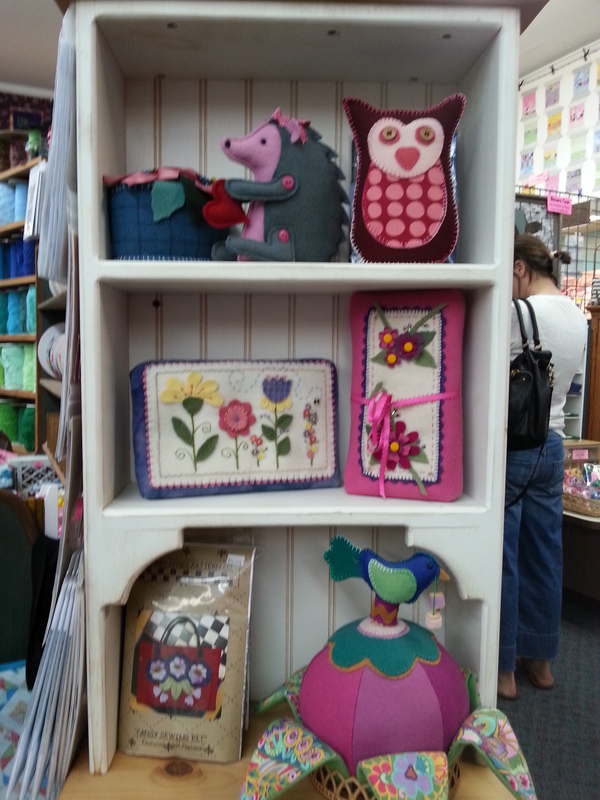 Sure, I would follow a sewing or needlework pattern and I always colored neatly inside the line. 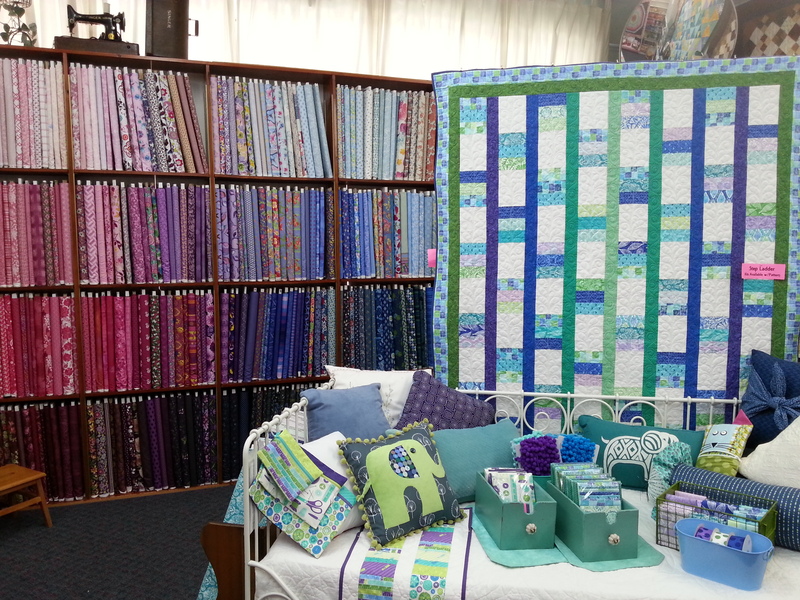 But through quilting and age, I’ve found the freedom to step outside the box and experiment with color, design and new technologies.” I hope these sentiments ring true for many of you and that quilting is a freeing and inspiring activity. I was fortunate to visit the Guildcrafters Quilt Shop in Berkley on my way to the Detroit Metro Quilt Guild from Ann Arbor. 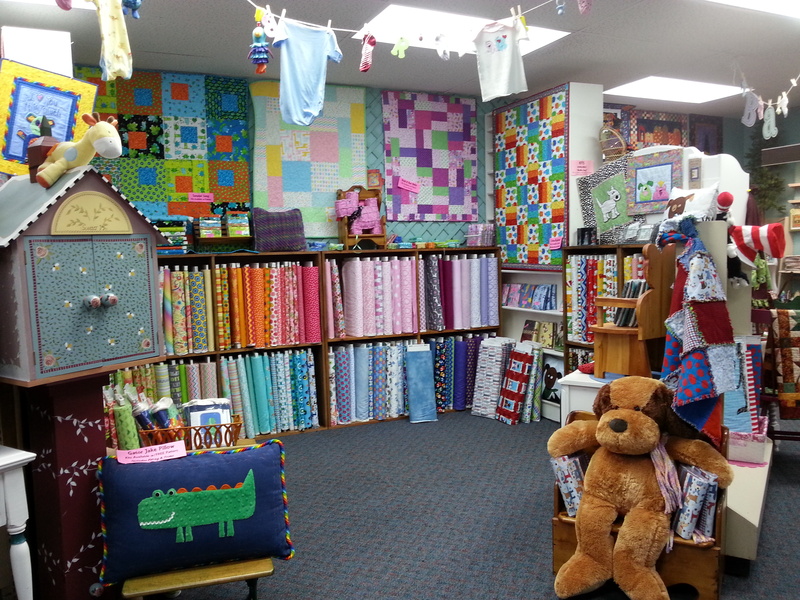 The store carries over 6,000 bolts of batiks, traditionals, reproductions, designer, novelties, wool, minkee and hundreds of flannels. I loved the character of this place with inviting displays and colorful quilt samples. It was inspiring and I’m sure that if I lived in this area, I would be a regular here. Here’s a pictorial tour. There was a spacious notions, books and patterns area and a section of wool. These woolly creations are wonderful and I especially liked the hedgehog. 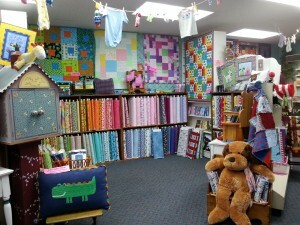 A whole section of the store was devoted to babies and children with attractive quilts, toys, clothing, fun accessories and appropriate fabrics. This was great to see all these beautiful samples to entice and inspire, such as the elephant pillow and the Dr. Seuss quilt. My studio is the upstairs room with the large window above the front door. The room won’t stay this tidy for long! As soon as I have caught up with my administration, I’ll start quilting again and the surfaces will become covered with fabric and new projects. 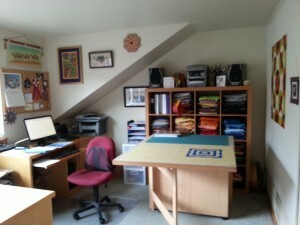 This half of the room, (left picture), shows my cutting table, office area and on the right hand side you can see my work wall. The IKEA shelves for storing part of my stash fit nicely on the back wall. In the bottom left of the picture is the corner of my sewing table. The sewing table occupies the other half of the room. 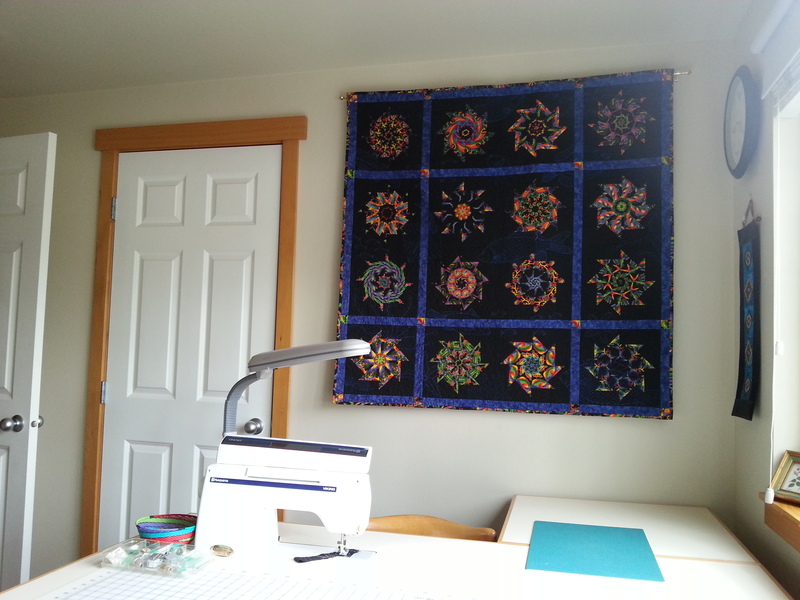 This large piece was custom made for me about 15 years ago by the cabinet-making husband of a quilting friend. He also made my cutting table. In my house search, a pre-requisite was a room large enough to accommodate these two bits of furniture and my desk. I have the lovely big north-facing window so there is plenty of natural light, but no direct sunlight which is perfect. The view looks out onto the other town houses and a stand of tall Douglas Firs. 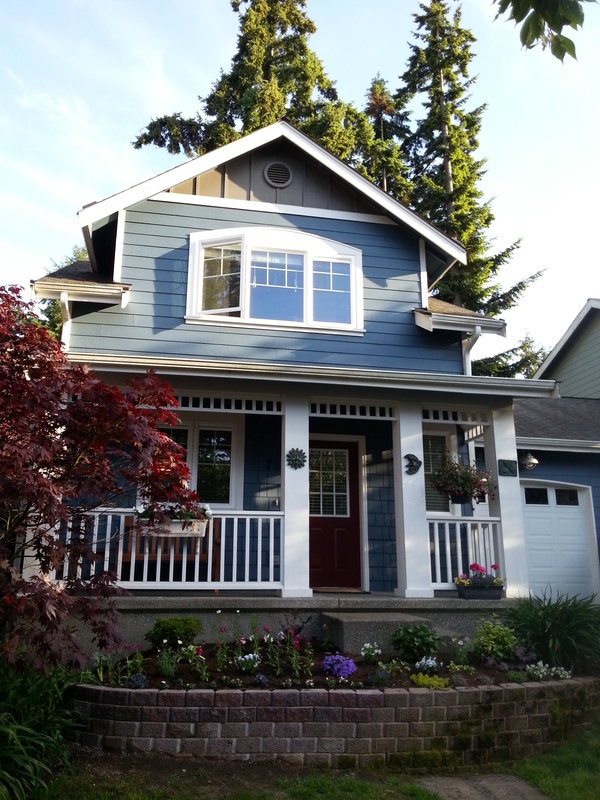 Right across the street is a cherry tree that was loaded with beautiful blossoms when I moved in. It’s very quiet as the main road is over on the other side of the house. Another important feature is having adequate storage space. 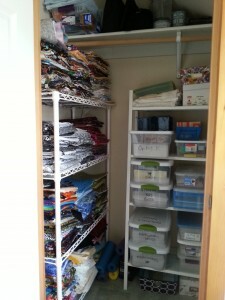 Here’s part of the closet behind the sewing table. 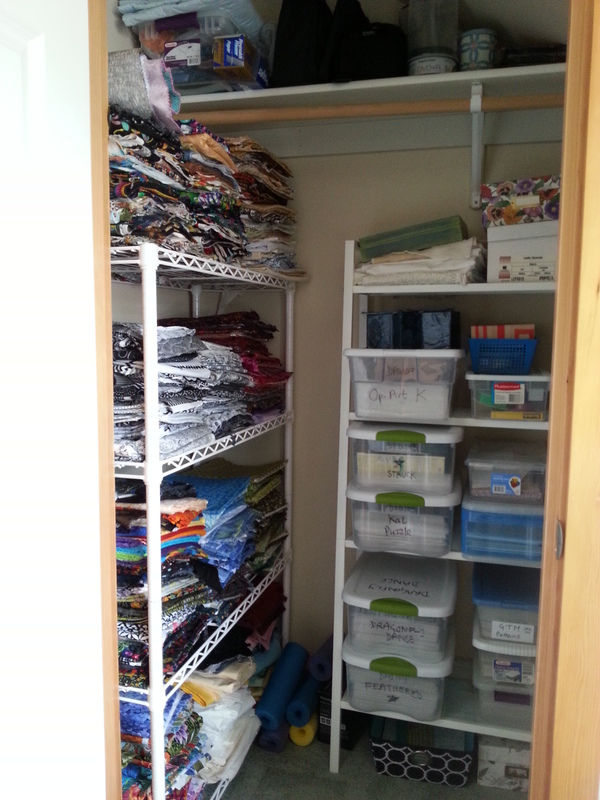 I have more fabric and metal shelves housing my plastic bins of patterns. This cupboard extends much further to the left and I have a smaller set of IKEA shelves and a more plastic storage bins. The bathroom off my studio is another storage area. I have a tall skinny bookcase in there for all my files, my two travelling suitcases, and I use the tub for miscellaneous items. 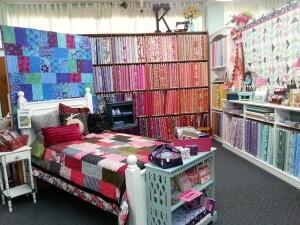 I’ve been used to having a spare bedroom with a bed to store all of my quilts flat. My new house has two rooms upstairs – my bedroom and my studio, so I no longer have this luxury. 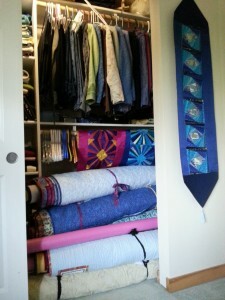 I have two quilt racks which I use for large quilts, one in my bedroom and one in the living room downstairs. 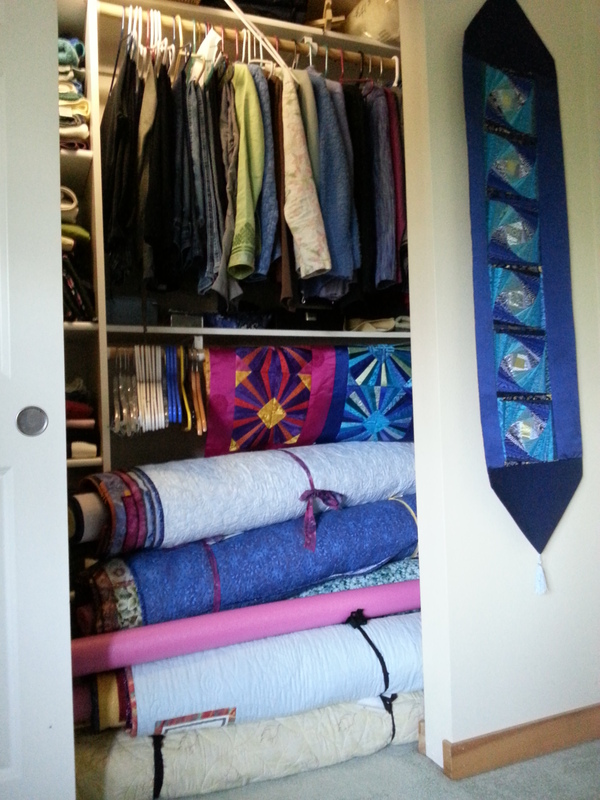 The dilemma was how to store the many quilts that I haul in and out for my lectures and workshops. 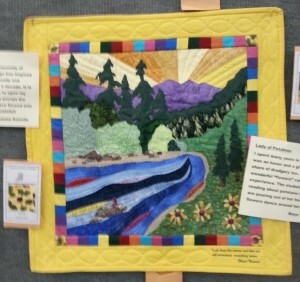 Several months ago one of the speakers at my local quilt guild, Kitsap Quilters Guild, brought their quilts rolled on Styrofoam swim noodles. This is my solution and so far it is working well. 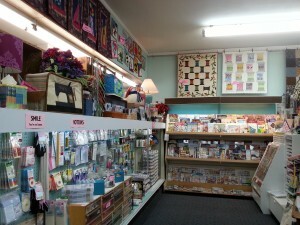 I have eight or nine noodles and the quilts are rolled by topic, e.g. 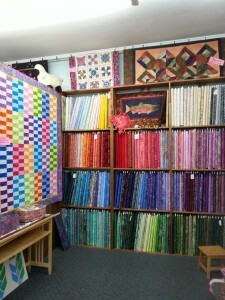 Bargello block quilts, template-free Kaleidoscope quilts. These rolls are stored in a lower section of my large built-in bedroom closet. They are easy to access and I can unroll them or roll them back up again on the bed.